Do you or someone you know have a severe love for 80’s gaming? There’s no better way get a dose of nostalgia and geek out a room than with these NES inspired cartridge pillows. Cuddly and great for any room of the house! 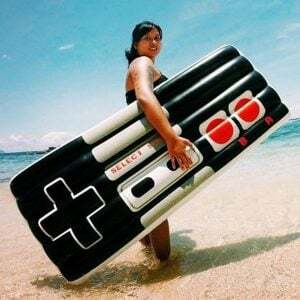 Bring a little nostalgia to the beach or pool party with this Nintendo pool float! It’s the perfect to relax on while showing off your love for retro games, and at 5 feet long this float is truly giant. Get 2 and you can play pool games against a friend! You don’t need to have traveled across the galaxy to find these little guys adorable! Inspired from Super Mario Galaxy, these Luma plushies will make a fine addition to any cosplay, or just to keep around for a cuddle.